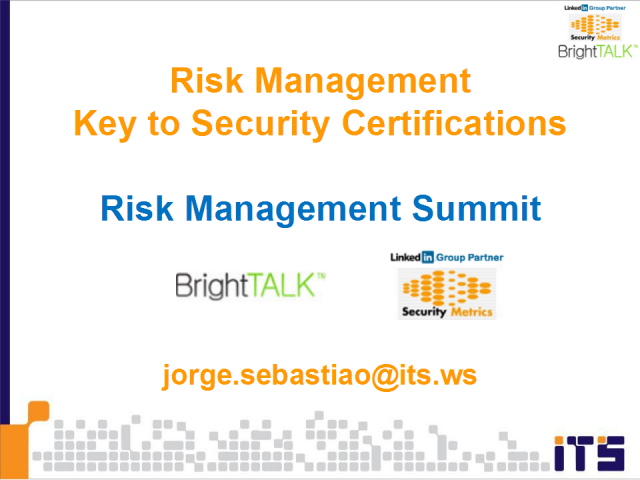 Either you decide to go for ISO/IEC27002 Security, ISO/IEC27031 ITC Business Continuity or BS25999 Business Continuity certification; a proper risk management program is key to obtain your organization certification. Security and Business Continuity is about mitigating and managing risks using a continuous skilled process. An overview of pragmatic and practical risk management is reviewed. With over 25 years of “Information and Communication Technology"-ICT experience, covering, managed services, outsourcing, security, business continuity, disaster recovery, vendor management, networking, infrastructure management, virtualization financial sector and telecom. Jorge Sebastiao brings experience, creativity, structure and innovation to ICT solutions.